1. Heat a grill to medium-high. Very lightly oil the grates. Place the pineapple slices on the preheated grill and cook, turning once, until lightly charred on both sides. Remove from the heat and let cool to room temperature. Dice into medium sized chunks. 2. Split each avocados and scoop the flesh into a medium bowl. Mash with a fork until mostly smooth. Stir in the onion, cilantro, lime juice, salt, and jalapeño and continue mashing until it has a fluffy whipped texture. Taste and adjust seasonings to your preferences. 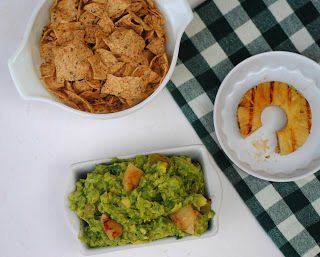 Stir in the diced pineapple and serve immediately with tortilla chips. Enjoy!